ISLAMABAD: JUI-F chief Maulana Fazlur Rehman on Saturday accused the Pakistan Tehreek-e-Insaf (PTI) of using the proposed 22nd Constitutional Amendment as an excuse to return to the National Assembly. Fazl was speaking alongside Federal Ministers and Pakistan Muslim League – Nawaz (PML-N) leaders Pervaiz Rashid and Khawaja Saad Rafique. The PML-N leaders had to come to visit the JUI-F chief to build consensus on introducing the 22nd Amendment to close the doors of horse-trading in the Senate elections for good. However, while almost all the other political groups support the government’s move for introducing the 22nd Amendment, the JUI-F chief says he has reservations with the amendment. 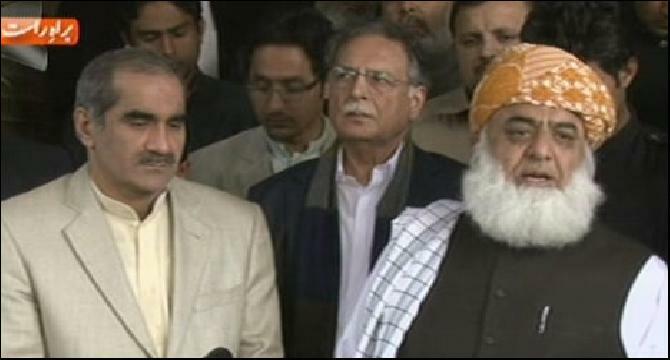 Fazl accused PTI chairman Imran Khan of using the amendment as an excuse to re-enter the assembly now that “nobody took notice of their protests and that their dharnas had failed”. He said that if PTI leaders return in this manner, they will not be considered “strangers and not members” of the National Assembly. Fazl said that he had no reservations against anyone's presence in the National Assembly, but that he will not allow anyone to enter the House using the amendment as an excuse. “Either they should say that they did not resign — whatever was presented in those envelopes was a lie. Or if they accept it, it should happen according to the law and the Constitution,” he said. “We have no reservations against anyone's presence in the Assembly. We will welcome them if they return,” he added. PML-N leader Pervaiz Rashid said that the JUI-F's reservations over the 22nd amendment will be conveyed to Prime Minister Nawaz Sharif. He said that the government will remove these reservations and find a solution in the coming days. Dear User, This is warning message for you against your activity. we notice duplicate content, and invalid views against your post. Next time your porfile will be banned for ever.